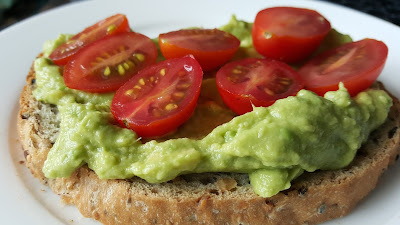 I have been in search of a loaf of bread I can make at home for hubby's sandwiches that's just a little better for you than but still tasted amazing. After some trial and errors, the following recipe has been celebrated by everyone in the house. As a bonus this recipe is vegan, no dairy or eggs. 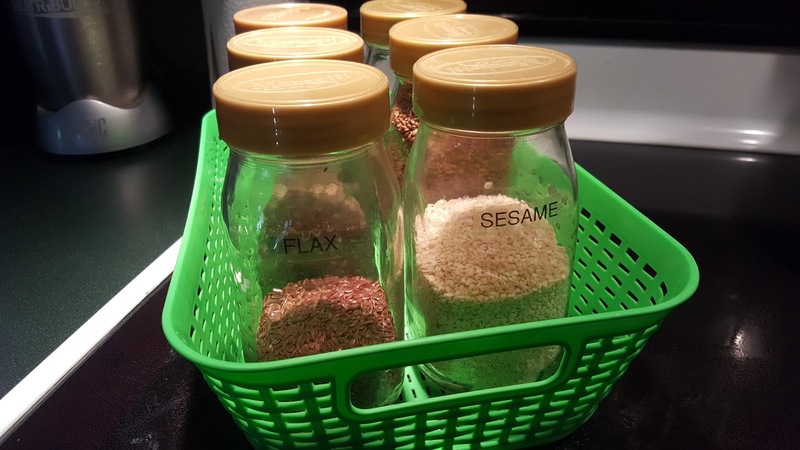 Flour, water, salt, yeast and SEEDS! Simple and delicious! Before I start, this is the bread maker I am currently using - Cuisinart CBK-100, available on Amazon Prime under $90. It's easy to use and has proven to be a workhorse with some weeks producing several loafs a week (both for us and to share with family). Place all ingredients in order above into your bread maker mixing/backing bowl. 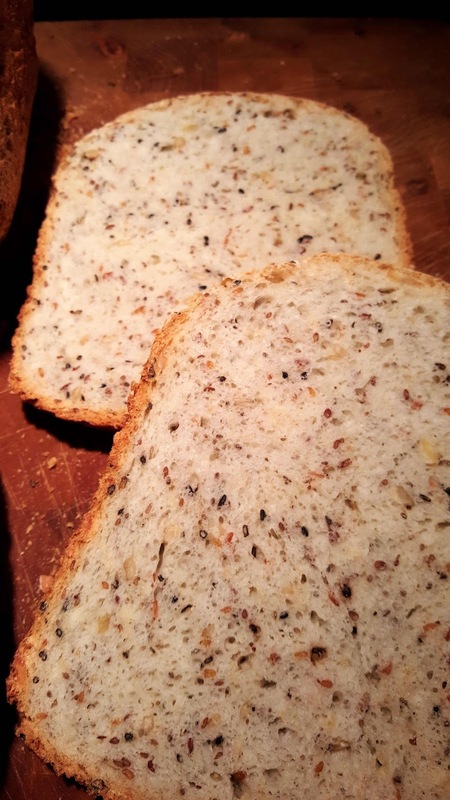 If your bread maker has an 'add to' setting where you can drop in additional ingredients you can add all the seeds at that step. I've tried both and find it easier to add everything at once. Bake on White Bread setting typically between 3.5 to 4 hours for mix, knead, proof/rise and bake. Our preference for crust (3 choices available on my bread maker) at Dark which makes the thickest crust available. My machine has an audio notice (6 beeps) when the mixing is done so the blade can be removed. I simply pull up the kneaded bread, pull off the blade and reshape the bread to replace into the bread maker. An end of bake signal prompts immediate removal of the bread pan, once able to be handled with protection, take the bread out and place on cooling rack. The longer you leave the bread in the pan, the less crispiness to the crust due to condensation. I use organic seeds and store them in glass upcycled jars (from Marzetti salad dressing) in a handy basket that can be pulled out from the pantry with one grab. Simplifying tasks in the kitchen will lead to greater and easier use. 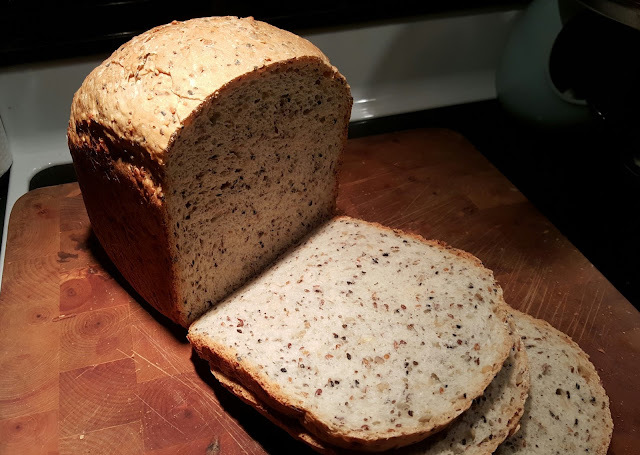 A closer look at all the seedy goodness inside the loaf, don't slice open till completely cooled to ensure even slices that don't rip or crumble. You can use a long serrated knife or an electric knife. To avoid a tirade of profanities when hubby makes his sandwiches, I slice a few at a time off the load for him and store the entire thing in a zip lock bag, pushing out as much air as possible. Since there are no preservatives in this bread, it's really only at it's optimum flavor and freshness for several days. My favorite application for the bread is Avocado toast with cherry tomatoes, a must try if you have not already. 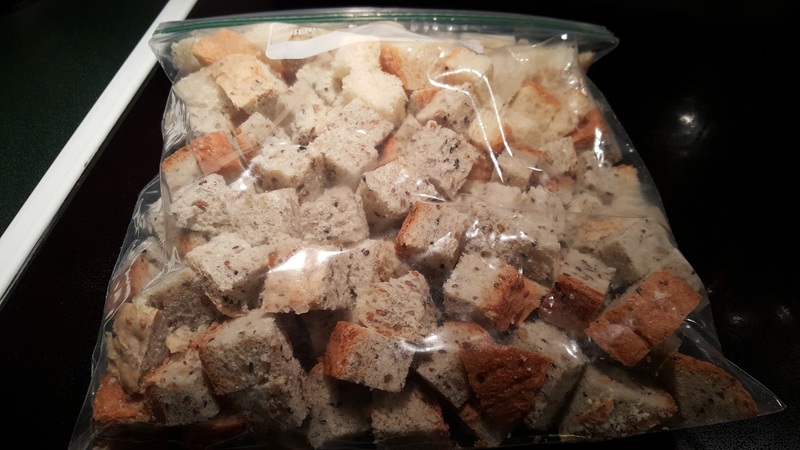 As mentioned earlier, the bread is preservatives free so after several days if there are any leftovers, I dice them up, pop them in a bag and freeze them. Great to pull out as needed to make croutons, savory bread pudding or homemade stuffing. No waste so every bit is utilized.